Google Maps for Android just got updated to version 5.7.0 and a new labs feature caught my attention; “Download map area“. I have been wanting such a feature for a long time for Google Maps. There are other ways to get offline maps, you have brut, MapDroyd and others. You can enable the feature in Google Maps by hitting the menu button -> More -> Labs -> And then check the Download map area feature. Click the Address that pops up (the bubble) to go to the more options view. 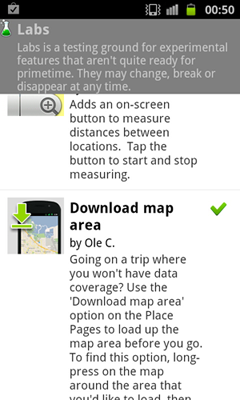 The app will then cache an area of the map, but only the regular map, no satellite map. If you now disable your internet connection, you can still zoom around in the map!